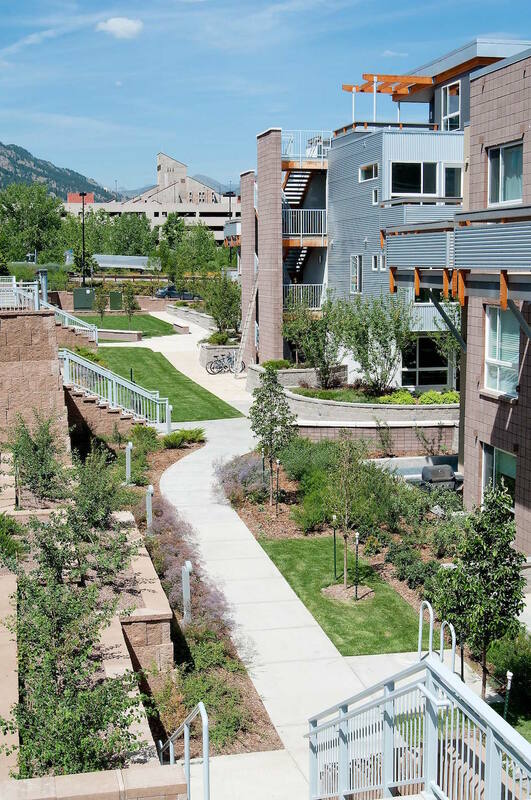 This exciting new high density project, at the edge of the University of Colorado’s Boulder Campus, is the first phase of a three-phase development. The project consists of four 4-story condominium buildings with retail space at the west end. Because of the expected young demographic, the landscape design consists of multiple formal and informal spaces for both passive and active recreation. 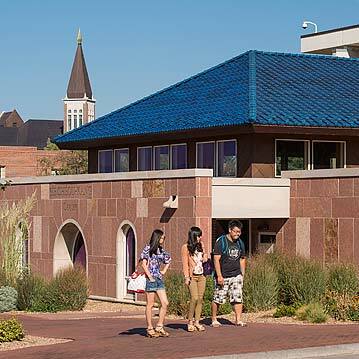 A number of larger gathering spaces are provided for residents, including bar-b-que areas, and chance meetings at the communal mailboxes. The design of the site had to overcome a number of technical challenges. 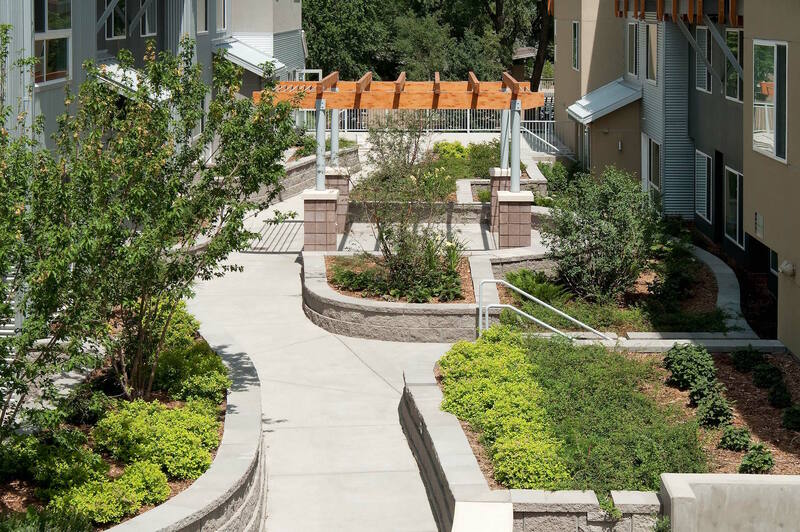 Most of the landscape occurs over a parking structure that has limited loading capacity and room for subsurface drainage. The tight configuration of the buildings creates deep shade for most of the landscape area. 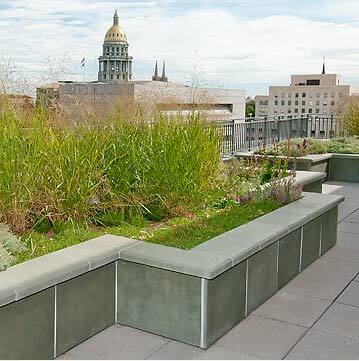 Finally, the project had to meet the City of Boulder’s Greenpoints program. All of the program and site constraints required a high level of technical competence to ensure that the outcome is a landscape that is both beautiful and achieves long-term success. This Second Phase of high density multi-family housing holds many of the technical design challenges faced by Lime Green Design in the initial phase. However, with a different user demographic, architect, and a modified outdoor program, new design thinking had to be employed. Access off the structural deck onto adjacent grade on all four sides, paired with a stepping structural slab on which most of the exterior spaces sit, add to the already complex issues associated with designing a landscape on structure. At the heart of the project a swimming pool will act as the social center. The addition of an outdoor bar-b-que area immediately adjacent to the pool provides a complementary dining spot in the summer months, and will continue to be used during the months that the pool is closed. Secondary gathering spaces in adjacent courtyards with bleacher style seating steps and a network of overhead lights provides additional social and hang-out hubs. 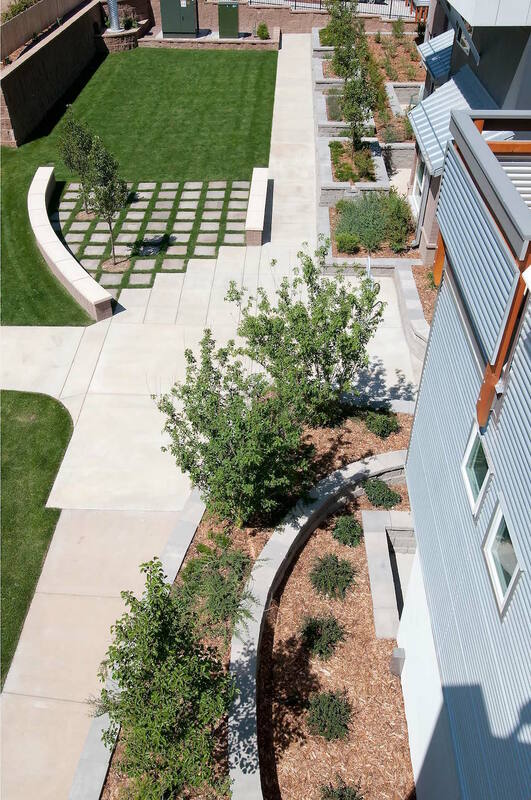 The raised landscaped planters throughout the project offer informal seating spots, encouraging residents to enjoy Boulder’s outdoor lifestyle.